The Dry by Jane harper has been described as “mythic and valiant” and there is no doubt that Jane Harper has become the latest Aussie literary sensation. The Dry has now won a swag of awards including the prestigious “Golden Dagger” award recently, as well as receiving glowing reviews and becoming a bestselling book. What is it about “The Dry” that has stuck a chord among the world’s readers? It is a compelling mystery that keeps you guessing, the small town characters are well rounded and believable. The main character Federal Police officer Aron Falk is not an heroic figure in the over the top Jack Reacher style. Rather he is characterized as a man driven by a dogged decency that compels him to stick around the insular country town he grew up in but left under a cloud in his teens, to help to solve the worst kind of crime, the murder of an entire family, or was it a murder suicide? There is something mythic about the dry Australian landscape, the prolonged drought becomes almost a character in the novel and an intrinsic part of the unravelling of the crime. Such is the success of The Dry that it has been optioned by Hollywood, and a new novel has been recently released featuring the Federal Police officer character Aron Falk called “Force of Nature”. Will Aron Falk become an iconic Aussie detective and generate a series of crime novels? Only time will tell. Read “The Dry” and decide for yourself. 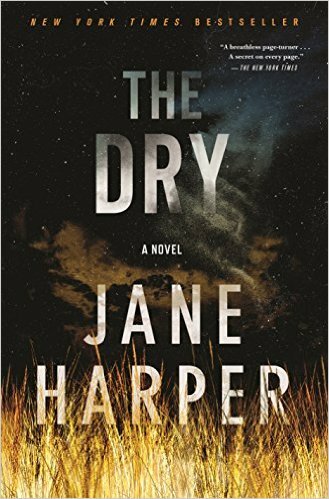 This entry was posted in Australian Authors, Book Reviews, Fiction, Mystery & Crime and tagged Jane Harper, The Dry by admin. Bookmark the permalink.